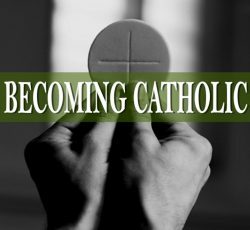 Are you thinking of joining the Catholic Church? We are so glad God led you here in your faith journey and are here to help in any way we can. For more information about continuing your journey into the Catholic Church, find more below. Each year, we facilitate a formation program for those who are discerning whether to become Catholic. This program is called the Rite of Christian Initiation of Adults. You will usually hear these referred to as “RCIA”. We encourage you to read more here to learn more about this process. For children who are 7 years old and older, the RCIA process is adapted for children. The first step in this formation process is an inquiry phase. If you are considering becoming Catholic, we encourage you to come and participate in this first phase! There are no expectations or obligations — it is simply a way for you to learn more about our faith as part of your own discernment. Each Catholic sponsor from outside the parish should obtain a sponsor certificate or letter from their pastor stating that they are a practicing Catholic. They should send the sponsor certificate or letter into the Parish Office (Attention Administrative Assistant) in advance of the day of the baptism. A second person, who is not Catholic, may function as a witness; this person must be a baptized Christian. If a sponsor cannot be at the baptism, that person can still be a sponsor. The substitute or “stand in” is called the proxy. A proxy does not need to be Catholic. If you have any questions, would like additional information, or are considering becoming Catholic, let us know! Just fill out the information below and we will contact you directly.